I was only talking to a mother and her daughter at the daughters bridal trial last Saturday about mixing foundations to get a custom colour just for your skin tone. 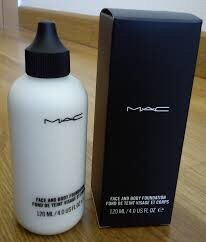 For years I have used the MAC pro Face and Body White foundation to lighten foundations and mix a much darker foundation to achieve a bespoke foundation for my clients. 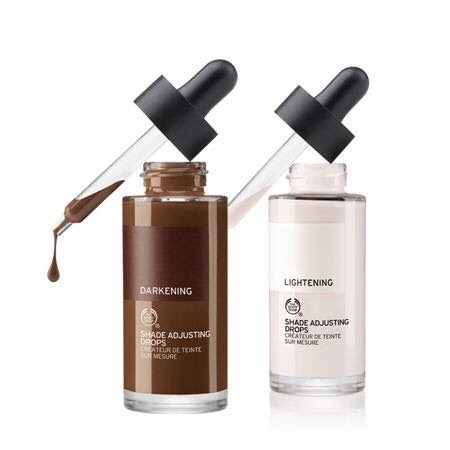 Now The Body Shop have brought out these handy darkening and lightening shade adjusting drops to change your foundations in a few simple steps. Every woman I know owns a few if not more bottles of foundation which are not the right colour for her skin tone and these offerings from The Body Shop are a game changer. At €17 they will be money well spent and I will be stocking up to have them on hand for any custom bespoke blending needs. Just think of it as an investment. Your skin gets darker during the summer as we are outside more(stay away rain) or you’ve been on a sun holiday and your foundation is too pale for you now. A drop of the darkening shade adjusting drops mixing liquid will darken your foundation a shade and a half saving you buying a darker foundation and you have this at hand. And likewise in Winter your skin gets lighter and your foundation is too dark, or you decide not to wear fake tan, a drop of this mixed with a pump of your foundation will give you a perfect foundation which blends in and no tide lines. I sometimes use some foundation on feet to cover purple/bluish tones and this will again be a welcome hand in the mixing stakes. Making life simpler. This is such an amazing product ! The lightening one Works like magic ✨❤️ Has helped to lighten some of my foundations and has saved the trouble of getting another separate foundation to get the right match !